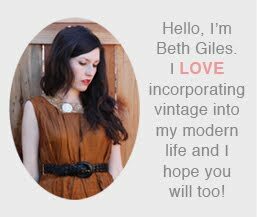 Vintage Clothing Blog | Vintage Wedding Dresses | Salvage Life: End of Summer Vintage Giveaway! End of Summer Vintage Giveaway! Summer is coming to an end and I have had two pairs of vintage shorts sitting around without a good way to photograph them for the shop (since I don't have one of those fancy dress forms with legs). So, I think it is time for a giveaway! The first is a pair of 50's high waisted nautical style and the second was an attempt at a shorts version (or skort) of the bow skirt, but alas no good way to display them. They are both a size small, 26" waist. These will be given away on a first come, first served basis. If you want to win, just be the first person to say which pair you want and how you would complete the outfit. Good Luck! Stay tuned for a special birthday (I'll be 29!!!) giveaway on Tuesday, Sept. 14th! Ooh! Second pair - I love that color and I'd wear it with a breton striped top and black tights and heels. I love the second pair!! Ps dizzymisslizzy at gmail dot com! The first pair would look great with a striped top!